The Holy Knives is the sonic vision of brothers Kyle and Kody Valentine, a band that infuses the sultry sounds of rock & roll with a tinge of desert psychedelia. Born and raised in New Orleans, residing in San Antonio, The Holy Knives released their debut EP, Ritual Bloom, this spring, performing at SXSW before touring across the United States. In between they travelled to Sonic Ranch studios in the deserts of West Texas, recording what would become their debut full-length album Year of the Black Dog. Kyle & Kody wrote over 100 songs in the past year, selecting what they felt best captured where they are currently as musicians and people. As with Ritual Bloom, the guys worked with Latin Grammy-nominated producer Manuel Calderon (The Chamanas, Nina Diaz), who helped shape their desert dreamscapes. Calderon’s band mate in The Chamanas, Paulina Reza, provides backing vocals on multiple tracks, providing a perfect foil to Kody’s haunting baritone. Listening to Year of the Black Dog is like wandering through a melancholy desert dream. It is a mood-driven album with a western heart. The atmosphere creates a surreal backdrop to Valentine’s self-exploratory lyrics. When this album was being written, there was no thematic center for its ideas. Instead, it could be thought of as something more like a dream journal, a deep dive into themselves. 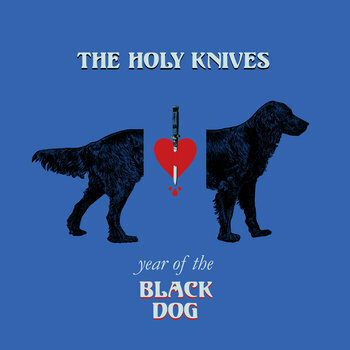 For The Holy Knives, Year of the Black Dog is a collection of cathartic confessionals that serves as their first self-portrait. The Holy Knives took their name from a combination of two of their favorite works of art, the film “The Holy Mountain” by Alejandro Jodorowsky and the poetry book The Singing Knives by Frank Stanford. Both of these works, while of different mediums, conjure a flood of beautiful, thought-provoking imagery, as well as share a fearlessness and a quest for truth through the irrational that The Holy Knives strives to capture in their music. Drawing musical inspiration from acts such as Timber Timbre, Arctic Monkeys, Beach House, and Portishead, The Holy Knives’ could be imagined performing at the Bang Bang Bar from Twin Peaks or playing in a True Detective episode. Their belief is that music is a sacred weapon you can use to ward off the march of reality.